A couple of months ago, I weaned myself off of my daily three-cups-of-coffee-with-a-little-too-much-creamer, along with really conscientiously increasing my water intake (I unofficially dub myself a cactus because I’m terrible at taking care of myself – internally). Now that my life is starting to be in a bit more of a stable position, I wanted to make a few more *internal beauty* changes. Improving the way I take care of myself on the inside is just as important (if not more) than how I take care of myself on the outside, so let’s get to these five new beauty habits for 2018 I plan on incorporating immediately. 2011-2014: lived in North Carolina because my (fiancé then) was in the US Navy, stationed there. I also was completing my MBA and planning my wedding while working full-time. 2014-2017: moved to Texas, found a job working at a Fortune 100 company (that I despised), found another job in PR (that was fun but a little too crazy for me), started Brighter, Darling; realized we didn’t love living in TX and started planning another cross-country move. 2017: moved to New Jersey (where I’m from originally), found new jobs, found a new place to live, looked for a dental practice to buy, bought dental practice, started looking for a house to buy. 2018: Happy to report we JUST closed on our house the first week of February! I’m sure life is going to continue to be a bit wacky, but this is honestly the first time I don’t feel like my life is in a state of transition. I feel like I can take a little bit of a breath and know that most BIG changes are out-of-the-way for a while. Like I mentioned earlier, I notice when my body is in a state of stress and I’m running around crazily, I drink a bit too much coffee. Anyone else? For me, when I do this I end up getting terrible stomach aches. Too much caffeine isn’t good for the body – and leads to dehydration which is terrible for the skin. I made the switch to drinking one cup a day of black or green tea only. I’ve always been a lover of tea, but within a month and not changing anything else about my diet, I lost 3-5 lbs (depending on the day haha) just by cutting out the coffee/creamer combo. In addition to the coffee, I’m terrible at drinking enough water. I’ve tried it all – apps, reminders, cute water bottles, etc. What seems to be working for me is every morning, while I’m making my breakfast, I take six bottles of water out and leave them on my work desk. This is an easy way to see how much water I have left to drink in the day and really keeps me on track to drink enough. I may even add a 7th bottle soon! The last internal change I want to make is to incorporate a more gentle workout regimen. I’ve always been someone who loves to workout hard – spinning, Pure Barre, kickboxing, intense cardio sessions… you name it… if it wasn’t at least an hour, what was the point? I’m going to take a different approach in 2018. I want to take long (at least 30 minutes… one hour preferably) walks daily and do yoga three days a week. Not power yoga either… definitely something a bit more zen. I’m not going to freak out about what the scale says. I want to focus on how I feel mentally and holistically. Who else is just so over disliking their body because it’s never going to look like a Victoria’s Secret model? Definitely me. So I’m going to start accepting myself for who I am without breaking my back at the gym. Along with these internal changes, we know I always am raving about skin care. But what about body care? 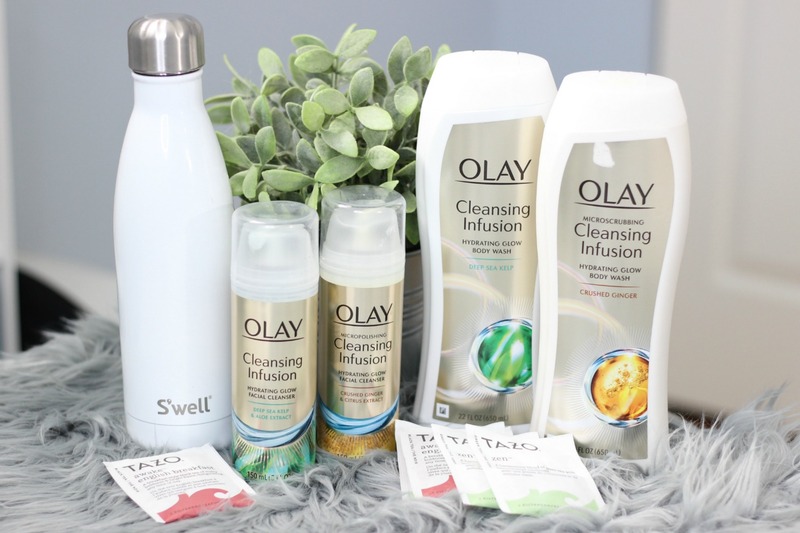 Olay released a new line of body washes in their Olay Cleansing Infusions line – Olay’s first complete face and body collection. I’ve been using the Olay Micropolishing Cleansing Infusion Hydrating Glow Facial Cleanser with Crushed Ginger & Citrus Extract at night after removing my makeup and it provides the perfect level of scrub to wash the day off and prep my skin to take in my nightly serums. In the mornings, I now use the Olay Cleansing Infusion Hydrating Glow Facial Cleanser with Deep Sea Kelp & Aloe Extract because it gently cleanses my skin of whatever treatments I used the night before without overdrying. The new Olay body washes are equally amazing at not drying out my skin but leaving me feeling clean and my skin looking soft. 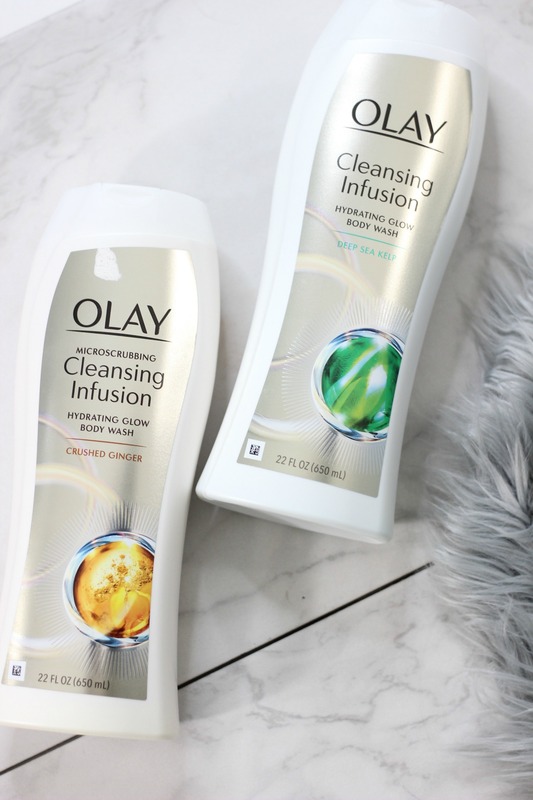 The Olay Microscrubbing Cleansing Infusion Hydrating Glow Body Wash with Crushed Ginger is great for days I take morning showers to really help me feel awake and re-energized since it has a micro polishing, exfoliating effect. 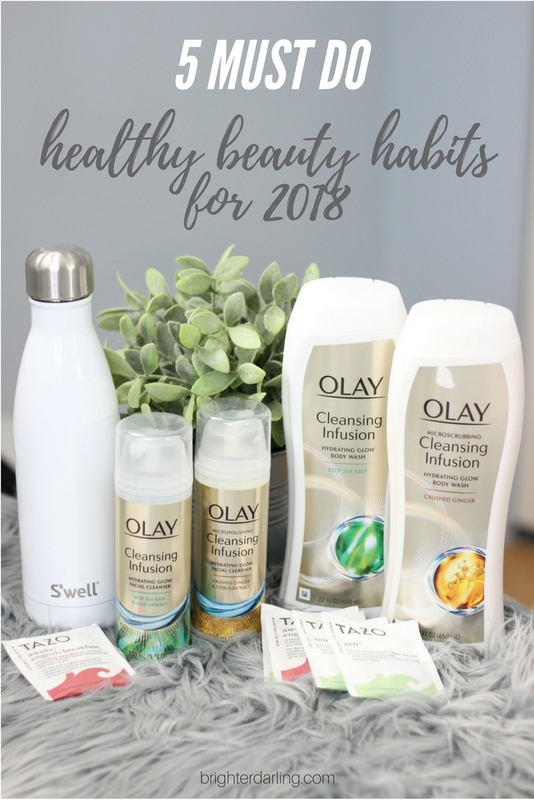 If I’m doing a night-time shower, I like using Olay Cleansing Infusion Hydrating Glow Body Wash with Deep Sea Kelp because it’s soothing and the lather is so creamy. Both of these body washes have been clinically proven to increase radiance in the skin after just one use. Now, I feel like I’m really taking care of myself from the inside out and bonus for not spending a fortune on ANY of these changes! 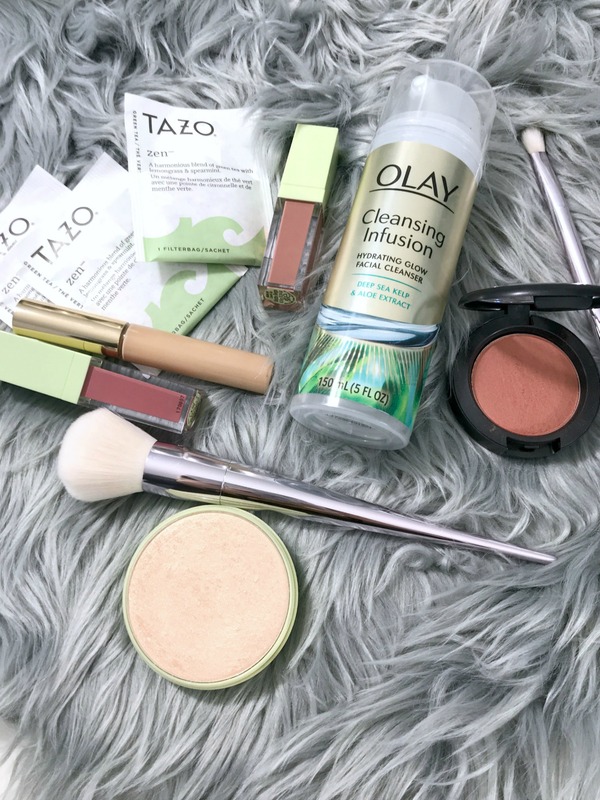 You all know I’ve talked about loving drugstore face washes and Olay products, in particular, before. So this shouldn’t be too much of a surprise. Why spend more on products when we don’t have to? Want to get your glow on? 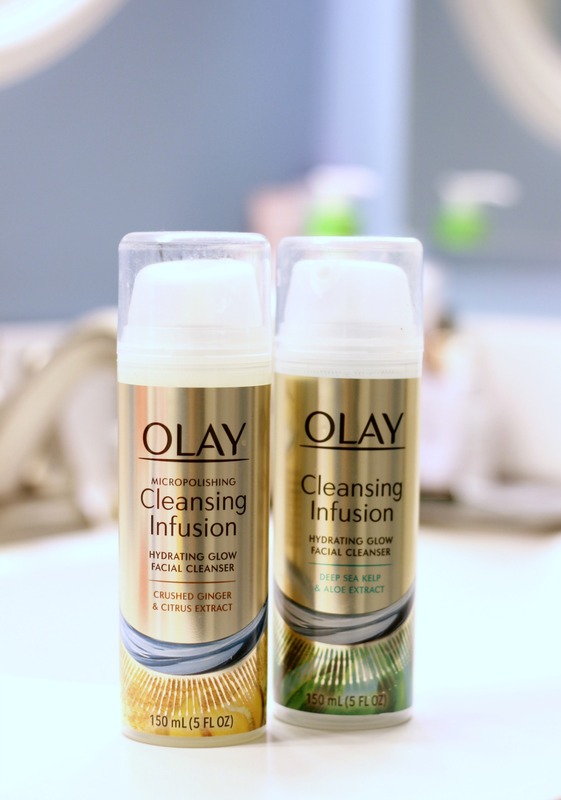 You’ve got to try Olay’s Cleansing Infusions collection at your local CVS by clicking here. I definitely recommend starting with the micropolishing face cleanser and microscrubbing body wash first – they’re absolutely my new favorites. Will be keeping you all posted on my new beauty habits for 2018 in a month or so via social media. Make sure you’re following me on Instagram for the latest updates. "What’s In My Bag? | Radley London Bow Lane Zip-Top Large Tote [YouTube]"
"Makeup Junkie Tag | 10 Beauty Questions [YouTube]"